It’s just as well the WA State NRM and Coastal Conference only comes around every two years, as there’s a lot to learn and absorb from the intense four days of presentations, posters, meetings, events, exhibits and corridor conversations. NACC was once again well represented at this year’s conference, with all of the NACC presentations and contributions being well received by delegates. 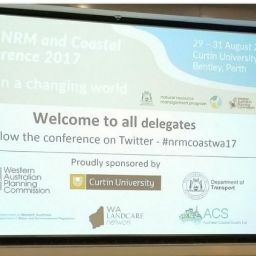 It was great to see so many familiar faces from the region on show at Curtin University – with a number of colleagues from local NRM, Landcare and Coastcare groups also in attendance. 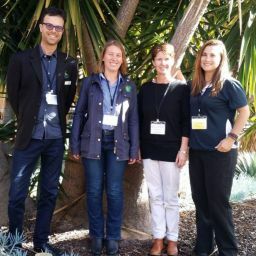 NACC provided assistance for some of our local community representatives to attend the conference – including Jude Sutherland from the Yarra Yarra Catchment Management Group and Anna Maxted of the Mingenew Irwin Group. Jude and Anna’s attendance was supported by NACC’s Regional Landcare Facilitator Stanley Yokwe, through funding provided by the National Landcare Programme. NACC CEO Richard McLellan, who chaired one of the sessions and presented a final plenary summary of the conference, said it was an excellent conference – and a very good one for NACC and our partners in particular. Richard singled-out for praise, the team at Moore Catchment Council – who took-out the Landcare Community Group Award at the WA Landcare Awards. Richard also saluted long-term NACC partners Batavia Coast Maritime Institute (at Central Regional TAFE) who won a Coastcare Award for On-ground Coastal Management. The team from Batavia Coast Maritime Institute. 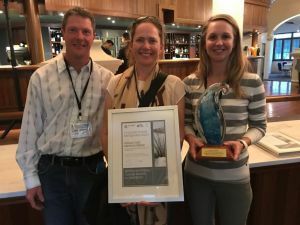 NACC’s very own national award-winning Coastal and Marine team was also finalist at the Coastcare groups section of the WA Awards – but was unfortunately pipped at the post on the night. Program leader Mic Payne said it was an honour just to be a finalist, and thanked the WA Landcare Network for their nomination. Other key delegates included NACC partners from the Australian Government’s National Landcare Programme, WA state government agencies, the WA Landcare Network, and all seven WA NRM groups (NRM_WA). 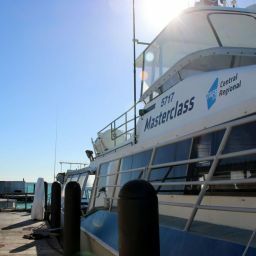 The importance of having Aboriginal people participating and partnering in NRM, reconnecting to country and bringing their unique perspective to NRM. The power of story-telling, of sharing knowledge, experience and lessons learned. The need for work to be done at multiple scales: Local, Regional, State and National. The importance and power of collaboration, of partnerships and working together, and the need for cross-regional collaboration on landscape-scale activities. The power of Passion and Perseverance – especially by the many volunteers and community members who support landcare and Coastcare groups. The need to communicate the value and the benefits of our natural capital, and our efforts to better protect and manage it. Coastal Hazard Risk Management (CHRMAP) continues to dominate coastal conference content as planners across the state come to grips with the implications of rising sea levels and increasing storm intensity predicted by climate change. With the conference over at the end of last week, the NACC team’s attention immediately swung-over the WA Threatened Species Forum – which will be held in Geraldton this week – 7-8 September – at the Queens Park Theatre.